Penn Yan, New York (KPEO)Cessna Citation VII and Cessna Citation Bravo (Both Part 135). Located at our Flight Division Headquarters. 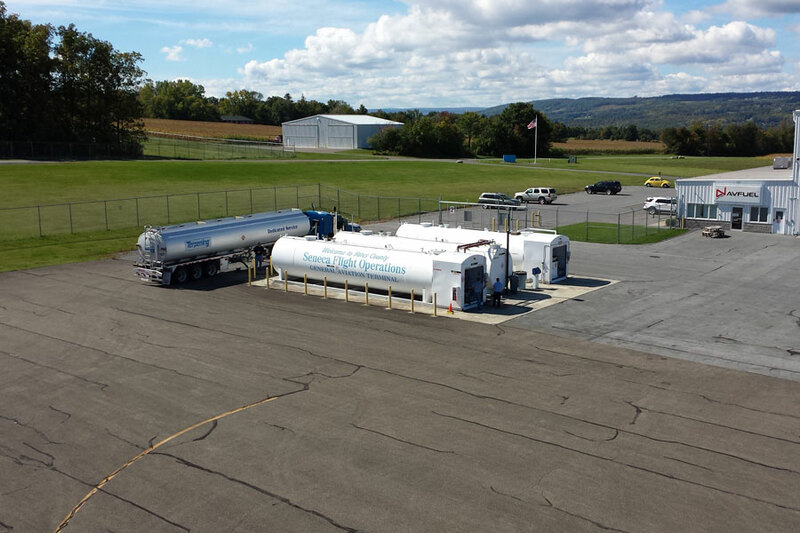 In addition to operating our aircraft, we also manage all aspects of the Penn Yan Airport under an Agreement with Yates County, New York. 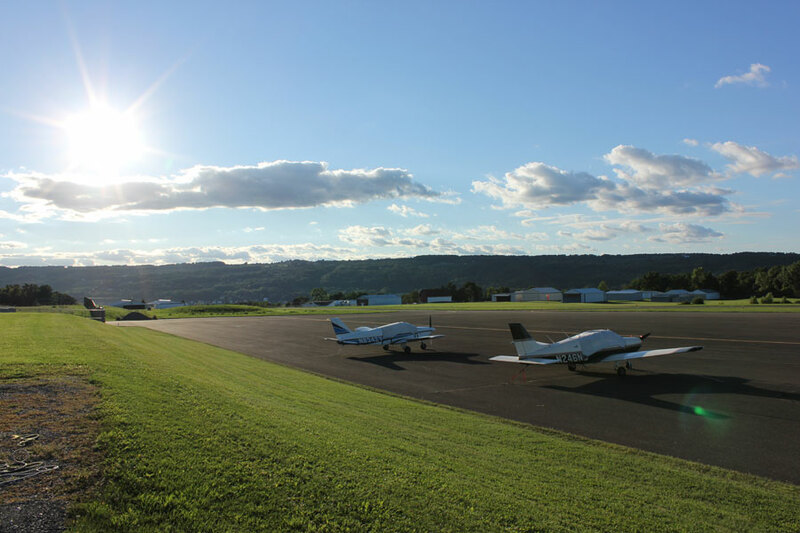 The number one goal of Seneca Flight Operations is to operate our aircraft and airport with zero accidents. 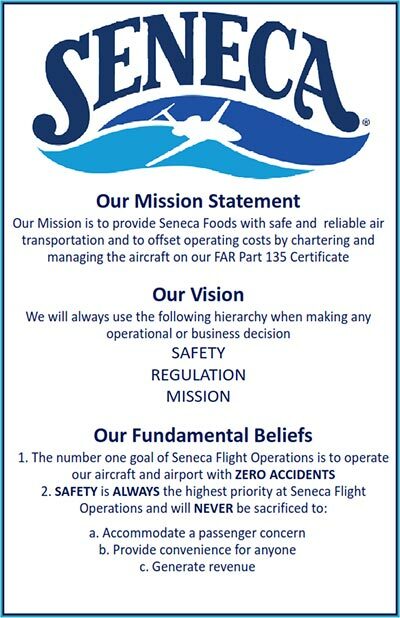 Safety is always the highest priority at Seneca Flight Operations and will never be sacrificed to accommodate a passenger concern, provide convenience for anyone or generate revenue. Why Work at Seneca Flight? We think it's essential that our employees strike a healthy Work/Life Balance, that's why we offer competitive benefits, respect personal matters, and provide an appropriate amount of time off. We also promote from within, and coordinate multiple wellness programs that are designed to keep our employees feeling balanced, and happy. Work environment is a big factor in personal satisfaction, and at Seneca, we're proud of our diverse work culture. We strive to attract and maintain a workforce that enriches our team experience and supports our shared vision for the future. At Seneca, you'll be part of a team of highly qualified and dedicated individuals. We believe in making the world a healthier, happier place starting with our own employees. At Seneca, you'll feel good about what you do. We feed the world. Seneca knows that a healthy work-life balance is the best way to achieve your full potential. Paid time away from work is not a luxury; it's a necessity. We respect time off for holidays, vacations, and illnesses. We provide a program called LifeBalance, a comprehensive and fully confidential resource to help us resolve issues and answer questions related to the wide variety of challenges we face every day like: parenting, work relationships, elder care, financial issues, emotional well-being, addiction and recovery, education, legal matters, and more. The Seneca Foods Wellness Program is ingrained into our business culture. The Wellness Program includes outreaches such as: on-site influenza immunizations and health screenings; smoking cessation assistance; health coaching; on-site wellness coordinators; regular company-wide multi-media communications on a variety of useful topics. Our vision at Seneca Foods is to continue to grow as the leader in packaged produce by remaining deeply rooted in our fundamental beliefs, and through a shared commitment to those we serve. That shared commitment directly involves our relationship with our employees. Employees will be treated with respect and we will look to promote from within to provide advancement opportunities to our employees and develop loyalty. We recognize that in order to achieve our vision, Seneca must continue its commitment to its loyal employees. Without their dedication and hard work, achievement of our goals would not be possible. All in all, it is the combined team effort of every member of our Seneca Family that will enable us to be successful in reaching it. We have developed programs to empower our employees with the skills necessary to help them in making a difference to our company. These programs positively impact both our employees and the work environment. Two key programs are Seneca GROWS (Get Rid of Waste Systematically) and Seneca SAVES (Seneca Adding Value Employee System). GROWS is an approach to learning based on the philosophy that job enrichment must come from uninhibited involvement of those affected. It highlights respect and understanding, and reinforces growth and engagement between the individual and the organization. At the center of GROWS is the development of a continuous improvement action plan. Action plans are instrumental in helping to reach many of Seneca's objectives. We create action plans by reviewing situations in the work area and looking for possible improvements. Many action plans impact the areas of Quality, Human Safety, Cost Reduction, Productivity, or the Environment. SAVES is an action oriented process improvement program founded on systematic lean problem solving, disciplined waste elimination, superior cost management, and iterative continuous improvements across the organization impacting areas such as quality, service delivery, and employee safety. The program is committed to supporting professional development and personal growth of employees by providing education, training, and direct coaching on the application of lean tools and methodologies. It also fosters a learning organization by promoting reflection, self-assessment, and learning from our experiences. Seneca Foods Corporation offers a competitive and comprehensive array of flexible benefits. Seneca Foods contributes significantly toward group health and dental and prescription drug coverage for eligible employees. We also offer levels of life, disability, and accidental death & dismemberment insurance from plans flexibly designed to meet individual and family needs. Seneca Foods offers several resources to help our employees plan for their successful retirement. It is worth noting that Seneca is one of the few remaining companies that offer both a 401(k) savings plan with a discretionary company match, and a defined benefit pension plan. A 401(k) plan is a savings plan by which eligible employees can save for their retirement by contributing pretax dollars from their pay directly into their 401(k) plan accounts. Seneca's 401(k) plan also has a discretionary company match, which means that, each year, the company is able to add to your 401(k) account, based on your own contributions to the Plan. Seneca also sponsors a defined benefit pension plan for eligible employees. A defined benefit pension plan is a retirement plan that is 100% paid for by the company. Eligibility for and participation in the pension plan are typically based on hours and years of service with the company. Seneca's significant investment in our pension plan supports the company's continuing commitment to assist us in planning for our retirement. 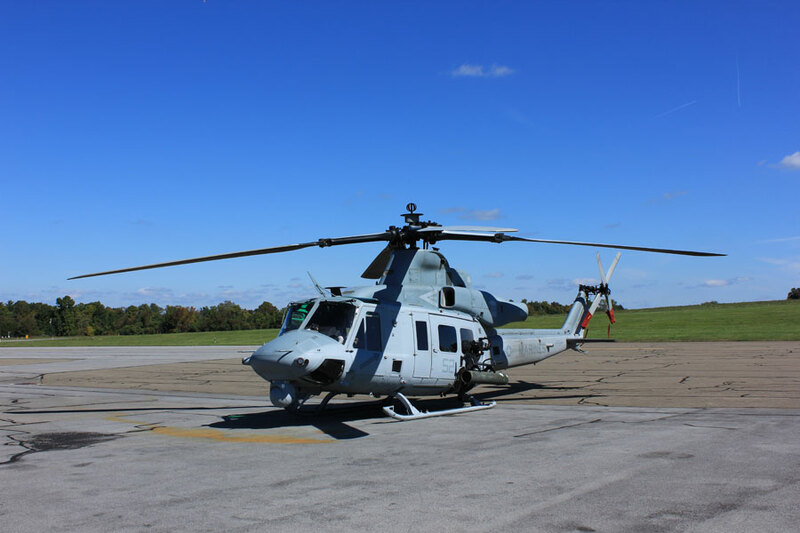 Seneca Flight Operations is a division of Seneca Foods Corporation and has been in continual operation since 1956. The focus in 1956 was to meet the corporate travel needs of the small juice company located in Dundee, New York. 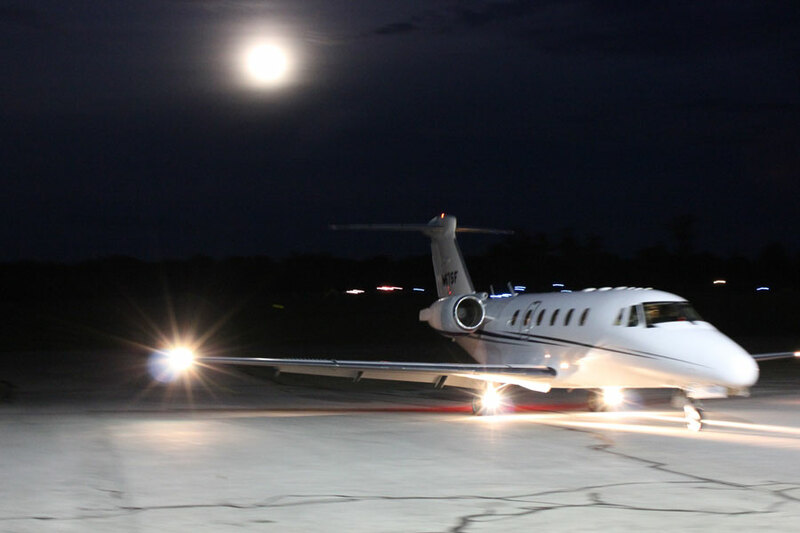 Today, Seneca Flight is a recognized and respected charter operator. 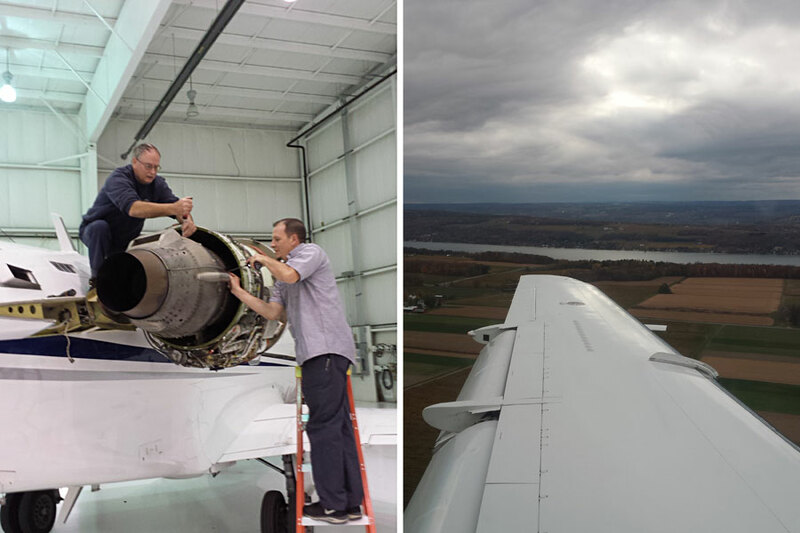 Still located at the Penn Yan – Yates County Airport, Seneca has replaced its twin engine piston plane with several Cessna Citation jets. 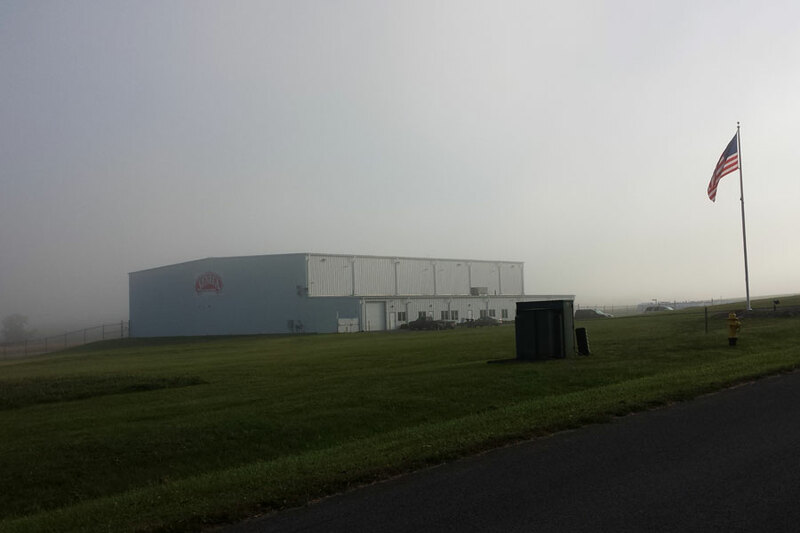 The Flight Division has grown as Seneca Foods has grown. 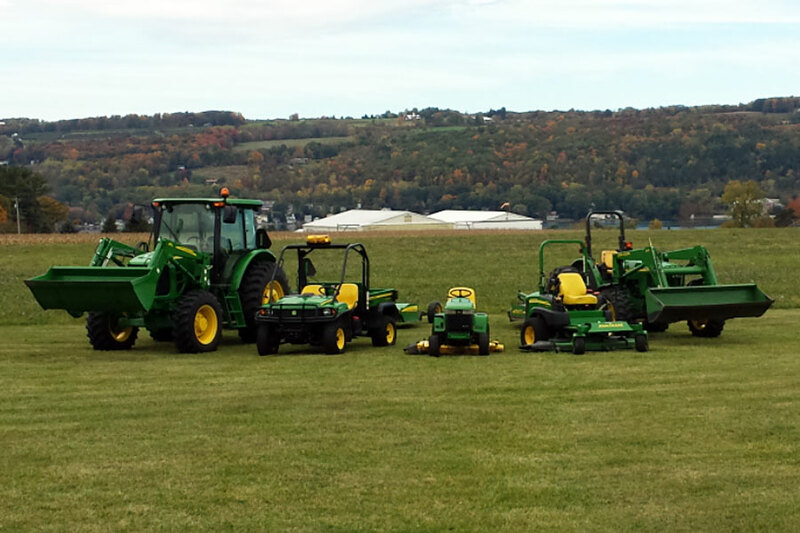 Details about the growth of Seneca into a World Leader in Agribusiness can be found here. At Seneca, We Feed the World. Seneca Foods is North America's leading provider of packaged fruits and vegetables, with facilities located throughout the United States. Our high quality products are primarily sourced from over 2,000 American farms. Seneca holds the largest share of the retail private label, food service, and export canned vegetable markets, distributing to over 90 countries. Products are also sold under the highly regarded brands of Libby's®, Aunt Nellie's®, Cherryman®, READ®, Seneca Farms® and Seneca labels, including Seneca snack chips. In addition, Seneca provides vegetable products under a contract packing agreement with B&G Foods North America, under the Green Giant label. Seneca's common stock is traded on the Nasdaq Global Stock Market under the symbols "SENEA" and "SENEB". SENEA is included in the S&P SmallCap 600, Russell 2000 and Russell 3000 indices.